In the December issue of Games Magazine they put together their list of the top 100 games of 2010. Nanuk is listed as a runner-up in the Family category! Obviously, we're honored to be included in the list. Given all the games released last year, narrowing the pile down must have been an enormous task. We're especially happy that Nanuk made it into the Family category; that's who we were thinking of when we developed the game! 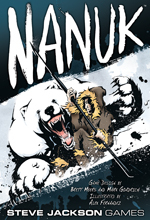 Congratulations to Brett Myers and Mark Goadrich, Nanuk's designers!